Leading a band is one of the certain high qualities Curtis brings to Against All Odds, for he is unquestionably the leader. 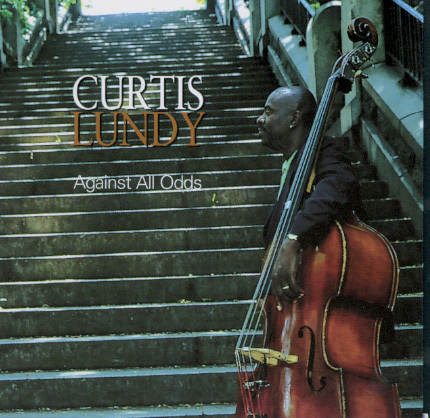 Unlike other bassists who might feel some sense of liberation from the traditional roles when afforded such an opportunity, Lundy does not seize the moment to exhibit gymnastic virtuosity or to pluck bass solos on every track. Instead he is content with truly swinging the ensemble and providing the substantive underpinning necessary to encourage successful output from the soloists. Comfortable in his role, Curtis chooses not to push raw ego to center stage. Given such an auspicious cast with John Hicks and Anthony Wonsey on piano; Winard Harper on drums; Roy Harper on trumpet and flugelhorn; Pleven Everett on trumpet; Bobby Watson on alts sax; and Shelley Carrol on tenor sax, there is absolutely no need for him to push the solo envelope. The tunes range from Curtis' robust bass call on the infectious opener, aptly titled "Players Anthem," to such lovely ballads as Onaje Allan Gumbs' hushed "All Things" and Curtis' burnt orange lament "Teardrops," to the optimistic melody of tenorist Shelley Carrol's "Sweet Audrey." Peven Everett, one of Betty's Jazz Ahead musicians, contributes the irresistible funky shuffle of "Groydology," with its insistent upper register piano ornamentation, a line tailor-made for Watson's soulful alto. Broadening the program is sister Carmen, who wrote three vocals for the date: "A Long Journey Home," "Blue Woman," which also serves as a feature for Hargrove's buttery flugelhorn, and "Where'd It Go." The latter theme is written squarely in the sweet spot of Carmen's rich, dark coffee voice.